The specimens shown in the first two rows, at right are fossil clams (Mercenaria permagna). They lived during the Pliocene-Pleistocene Periods. 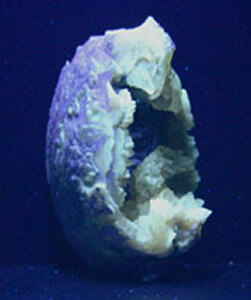 The specimens were obtained from Ruck's Pit, Okeechobee Co., Florida. 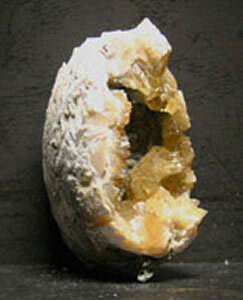 The crystals lining the shells are calcite. Under regular light the specimen has a white to greyish-tan exterior. 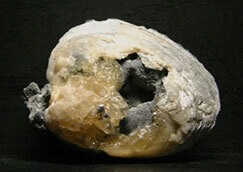 The interior is lined with clear to yellowish calcite crystals. 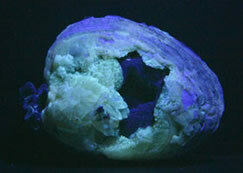 Under long wave ultraviolet light portions of the shell and the calcite crystals fluoresce a creamy white. 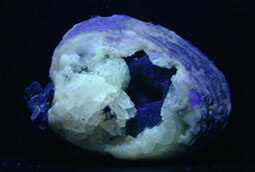 These same areas fluoresce a white to bluish white under short wave ultraviolet light. 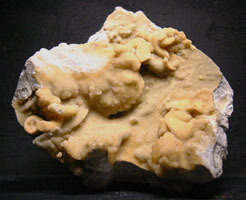 The third row is calcite encrusted clams, shells, etc. from Dade County, Florida. 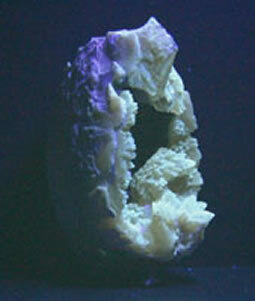 The specimen is from the Pliocene-Pleistocene Period. 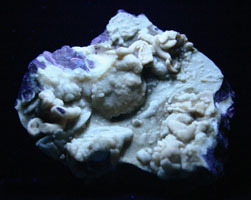 The calcite encrustation has a yellow or brownish appearance under normal lighting and a creamy white fluorescence under long wave ultraviolet light. 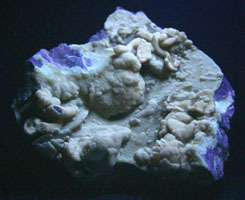 Under short wave ultraviolet light the calcite areas have a bluish white fluorescence.